Today, the U.S. Bureau of Economic Analysis (BEA) released quarterly personal income data at the state level. Per usual, along with the 2010 Q3 income estimate, the BEA also revised the most recent quarters as well. The revisions, as seen in the graph below, were downward although the vast majority of the revisions were isolated to the Farm Proprietors” Income category, which has accounted for less than 0.5 percent each quarter since 1994. While revisions in this category were quite large (initially reported values of around $1 billion were revised down to a little more than $200 million), the larger income categories saw only minor revisions. As an example: Wages and Salaries, approximately 55 percent of Total Personal Income, were revised downward for 2010 Q1 by 0.26 percent but revised upward by 0.68 percent for 2010 Q2. (The red portion in the graph below is our office’s most recent forecasted value). Overall, nominal personal income in Oregon has been increasing for the past four quarters, with wages and salaries increasing the past two. 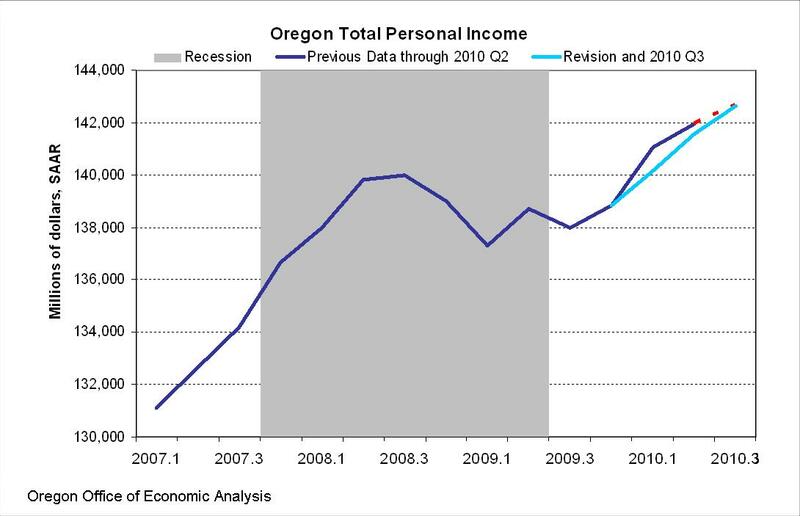 On a quarter-over-quarter basis, Oregon Total Personal Income increased 0.76 percent from the second quarter to the third, ranking 28th best in the country among all states (the U.S. total increased 0.67 percent). On a year-over-year basis, Oregon income increased 3.38 percent, ranking 29th best, while the U.S. total increased 3.57 percent. 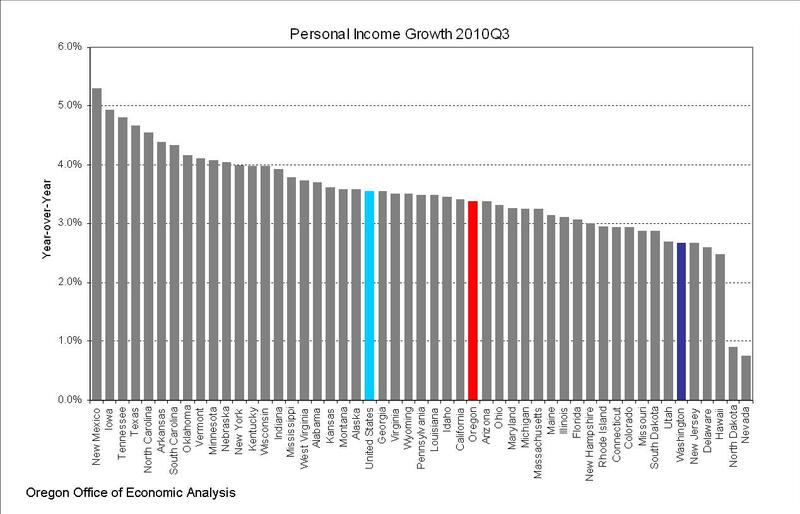 The chart below illustrates each state’s year-over-year Total Personal Income growth for the third quarter. While increasing personal income is certainly good news, Oregon, along with the nation, remains below pre-recessionary levels on an inflation-adjusted basis. The first graph in the post shows only nominal Total Personal Income. As illustrated in a previous post, during recessions Transfer Payments and other automatic stabilizers kick in and substitute for some of the income loss due to job loss. As this happens, total income does not fall by as large of an amount as, say, wages do, as the transfer payments are able to prop up income to some degree. One way to gauge the true underlying state of income is to look at Total Personal Income minus Transfer Payments, on an inflation adjusted basis. 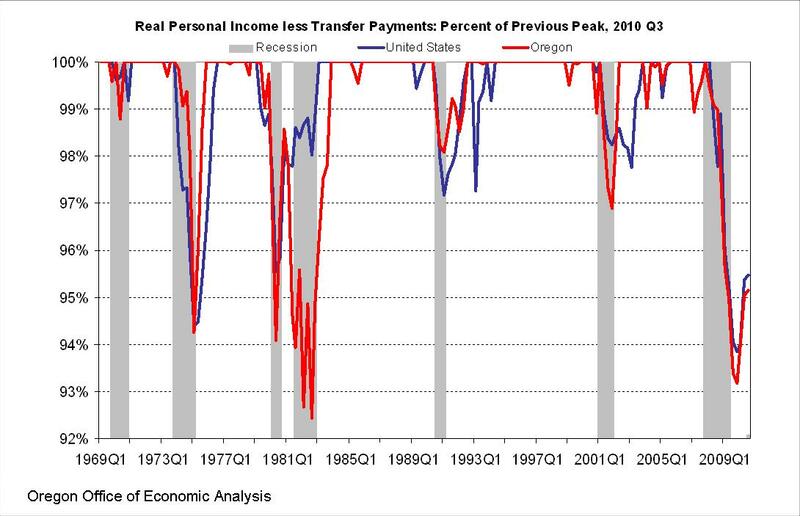 As the graph below illustrates, Oregon’s real income less transfer payments remains 4.9 percent below pre-recession levels (the U.S. is 4.5 percent below). These values are improvements from the the depths of the recession when Oregon’s income was 6.8 percent below peak levels and the U.S.’ was 6.2 percent, however there remains quite a bit of ground to make up to reach the levels from just before the recession. It is interesting to take a look at the historical records and see how each recession impacted Oregon’s real personal income. Just as Oregon lost many more jobs during the early 1980s than the nation overall, Oregon’s personal income fell quite a bit more as well. Likewise, just as that recession took a slightly larger toll on the labor market than the current recession, real personal income also fell further in the early 1980s than it has today.